Osh is the second largest city in Kyrgyzstan, and is reputedly 3,000 years old. Archaeologists have found artifacts dating back to the fifth century B.C. One claim that is often heard is that Osh is "Older than Rome". There are several legends about the origin of the city - including claims to having been founded by Solomon or Alexander the Great. Even if such a grand personage did not establish Osh, it's position at a crossroads along the ancient trading routes that became known as the Great Silk Road almost guaranteed that it would become a major settlement. In the period betweem the 10th and the 12th centuries it was the third largest city in the Ferghana Valley, and in 1762 it joined the Khanate of Kokand and became one of the six trading centers of the Khanate. Assimilated into Tsarist Russia in the 19th century, the city expanded onto the left bank of the river and European style houses started to appear. Osh is mentioned in the greatest epic of the Kyrgyz People, the "Manas". The city is the administrative center of Osh province, at the head of the Ferghana valley, and lies close to the border with Uzbekistan. A large number of travelers along the Silk Road use the nearby Dostuk border crossing. The mountain ranges that criss-cross the country effectively divide the North from the South and many say that the Kyrgyz in the South are quite different from those in the North - more independent and proud than those of the Russified Northerners. There are really only two North-South routes - the main Bishkek-Osh road, and the Bishkek-Torugart road. This fact, the proximity of the city to the Uzbek border and the large number of ethnic Uzbeks in the local population means that often this area is more attuned to it's neighbor than to Kyrgyzstan itself. The differences between the two nationalities came to a head in 1990, when riots in a village not far from the city (Kara Suu) left over 300 dead, many more injured, and caused considerable damage to property. There are several flights a day between Bishkek and Osh, but the timetable can sometimes appear to be more wishful thinking than actual fact. There is also the spectacular Bishkek-Osh highway, recently rebuilt as one of the nicest roads in Central Asia. The road may be breathtaking - but it can also be dangerous, with many accidents (and fatalities) each year. In 2001, a number of people died from fumes in the Tuu Ashu tunnel after a car broke down, halting traffic. The Tuu Ashu pass (actually, Ashu means "pass" in Kyrgyz) is the highest point on the road at 3,586m - and the gorge to Kara Balta is well worth the journey in itself. The other side of the pass is the plain of Suusamir, past which is the Toktogul reservoir and hydroelectric power station, featured on the 100 Som note. Traveling to the South and East to skirt around the Uzbek part of the Ferghana valley, the road passes the turn to Arslanbob, where there are groves of ancient Walnut trees; it is from here that Alexander the Great is supposed to have sent samples of the tees back to Macedonia; eventually it comes to Djalalabad. A bit further on is Uzgen, where there are several archaeological ruins (mausoleums and a tower, or minaret, which are featured on the 50 Som note. Not far from Osh are the Caves of Chil Ustin and the petroglyphs of Avaran. The Ak-Buura River runs through the city from North to South, and to the west is Sulaiman Too ("Solomon's mountain"), which dominates the city. Some Muslims consider it sacred and make a pilgrimage to the site where Muhammad is supposed to have once prayed. For some reason (in profile some people think it resembles a pregnant woman) it is also revered by many women who have been unable to bear children. At the top of a short 20 minute climb is a flagpole, and a mosque built in 1497 by the 14 year old Babur, who had recently been crowned King of the Ferghana Valley; he later went on to become the founder of the Mogul dynasty in India; the mosque was destroyed and rebuilt twice, and is another center for pilgrimage. There is also a small archaeological-cultural museum here, with many ancient artifacts discovered in the city environs. A historical-ethnographic museum called the Great Silk Road Museum, on Kurmanjan Datka, has well crafted exhibitions which focus on South Kyrgyzstan and cover the Silk Road days; Kyrgyz immigration from southern Siberia; the Kokand Khanate; Russian annexation in 1865 and the Bolshevik takeover from 1917. One interesting exhibit is a map dating from 1953 which shows the different Kyrgyz tribes and clans (still a very important factor in Kyrgyz society today). In the city is a statue of Kurmanjan Dakta ("Queen of the South") who opposed Russian expansion in the region and is featured on the 50 Som note. There is also a statue of Lenin. Nearby is a war memorial that bears the inscription (in Russian and Kyrgyz) "No One is Forgotten - Nothing is Forgotten". Most guidebooks refer to the bazaar as one of the most picturesque in all of Asia, stretching for about a kilometer along the banks of the river. Also worth visiting are the Rabat Abdul Khan Mosque (apparently only if you are a suitably dressed man) and the Russian Orthodox Church. Some way from the city are some spectacular caves and the Pamir mountains. In Osh are several guesthouses and hotels, and a number of local tour companies can offer services in the region. Osh is an ancient town on the Great Silk Road, and celebrated its 3,000 year anniversary a few years ago. The architecture of the town is completely different from that of Bishkek, as there are far fewer Soviet buildings, and most houses are small handmade affairs, mainly in the Uzbek style with wooden ornamentation. The only element which the town has in common with Bishkek are the tree-lined boulevards and parks. The town is especially famous for its bazaar, which is about 2,000 years old and has existed at the same location on the banks of the Syr-Darya river since its creation. There you can find practically anything, from the vegetables, fruits and nuts the Ferghana valley is so famous for, to meat, clothes, household goods, souvenirs and so on. Just wander around and see what you find! The main sight of the town is Suleiman mountain, the mountain or throne of Solomon. There are several legends told around town, which are best listened to when walking up the narrow path. On the way, you pass the Historical Museum, which was built in Soviet times (and looks it), where you may learn of the region's religious practicws before the arrival of Islam, and also about its wildlife and traditional dress. Climbing up the hill, you reach Babur's house on top. 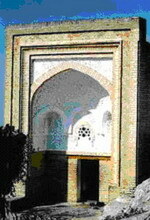 This is a small oriental style house (now a mosque) that was built by the Central Asian emperor Babur, who reigned in Osh. It is said that he loved the mountain so much that he ascended every day in the morning and came down every evening, although in those times no path led the way and he had to climb. So in the end, he decided to build himself a little house on top. In modern times, people go there to pray, as the hill has always been a place of pilgrimage; especially for people of the region, it is something of a "Little Mecca", as it is sometimes called. Descending and turning to the left, you come to a mosque from the 16th century, the mosque of Rabat Abdullah Khan, which is one of the main mosques, and sees about 1,000 regular visitors. Osh is definitely a town where you can walk around for hours, without too much sightseeing, just to get to know the culture and feel the place for yourself.